Guidelines Pocketcards(TM) are multifold pocketcards containing society-endorsed evidence-based treatment guidelines in a brief algorithmic format that is most preferred by practicing clinicians, quality managers, nurses, educators, and medical students. The Antithrombotic Therapy in the Prevention of Venous Thromboembolism Guidelines Pocketcard is endorsed by the American College of Chest Physicians (ACCP) and is based on the latest ACCP guidelines. This practical quick-reference tool contains screening, diagnostic, treatment algorithm, drug therapy, dosing information, patient monitoring, and counseling points. 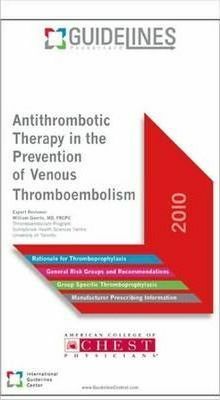 The Antithrombotic Therapy in the Prevention of Venous Thromboembolism Guidelines Pocketcard provides all that is needed to make accurate clinical decisions at the point of care including the rationale for thromboprophylaxis, recommendations by risk group, risk assessment and stratification algorithms, current medication tables with brand and generic names, and detailed drug information including strengths and formulations. This pocketcard is useful in the following applications: point-of-care, education, QI interventions, clinical trials, medical reference, clinical research. Dr. Geerts is professor of medicine at the University of Toronto in Canada. He is also director of the Thromboembolism Program at Sunnybrook Health Sciences Centre in Toronto. His research interests involve the diagnosis, treatment, and prevention of thromboembolic disease, as well as guideline implementation and quality-of-care improvement. He is chair of the Prevention of Venous Thromboembolism section of the ACCP Guidelines on Antithrombotic Therapy.